SINN FÉIN COUNCILLOR Noeleen Reilly says she is resigning from the party with immediate effect, citing a failure of the leadership to deal with a campaign of bullying against her. The Ballymun-based councillor was suspended for six months by the Sinn Féin ard chomhairle at the weekend. Dessie Ellis, a TD for the area, was handed a ‘censure’ by the leadership board at the same meeting. The two have been involved in a war of words for some months. 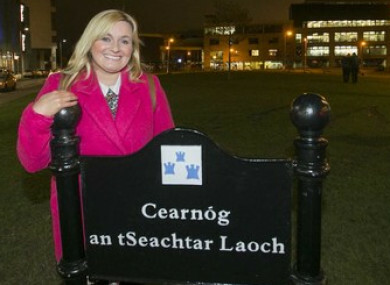 Reilly has said she will continue on as a councillor for the area, but the party is asking that she hand back the “Sinn Féin Dublin City Council seat”. “I am resigning from Sinn Féin with immediate effect,” Reilly said in a statement this morning. She said the decision of the ard chomhairle left her with little choice “as I could not remain in the party and defend myself”. “I have been the victim of an orchestrated bullying campaign by a number of people in Dublin North West,” Reilly said. She said she had first gone to party bosses to raise concerns over the alleged bullying in 2014, but that she had been ignored. “I was always told to keep these matters internal and I did so for four years hoping that justice would take place at some time,” her statement said. “I will be remaining as a councillor and will continue to work hard for the people of Dublin North West. I want to wish all the good people in Sinn Féin the best in the future and thank you for your support over the years. Party chairman Declan Kearney announced the disciplinary measures being taken against Ellis and Reilly in a statement on Saturday night. A statement on behalf of Ellis, accepting the decision, was sent from the Sinn Féín press office a few minutes later. “There have been ongoing issues within the Dublin North West Constituency,” Kearney said. “These have been examined [by] Sinn Féin, and the Ard Chomhairle have made a number of recommendations. “Following a complaint from a fellow councillor, Councillor Noeleen Reilly has been suspended from the party for 6 Months. “With regard to complaints by Councillor Noeleen Reilly about comments in the media by Dessie Ellis, TD, he will be censured by the party. As per our party constitution, the people concerned can appeal these recommendations. “I accept the decision of the Ard Chomhairle, and I apologise for the comments I made in the media about Councillor Reilly. I now want to move on to represent the people of Dublin North-West and to build the party locally. Reilly’s statement was emailed from a personal account this morning. Asked to respond to this morning’s announcement by Reilly, the Sinn Féin press office sent a statement referencing the allegations against her made by another councillor in the area. The councillor in question said she was satisfied with how Sinn Féin resolved the issue. The party’s statement also requested that Reilly hand “the Sinn Féin Dublin City Council seat back to the party”. Referencing one of Reilly’s specific allegations, Sinn Féin said the party had told the councillor on numerous occasions to report the alleged incident to An Garda Síochána. Councillor Reilly was asked by TheJournal.ie earlier today if she wishes to provide a response to Sinn Féin’s latest response. Meanwhile, Labour leader Brendan Howlin issued a statement this afternoon suggesting that the matter of the “feuding factions” in Dublin North West may be one for the gardaí to consider, rather than the Sinn Féin leadership. 64-year-old Ellis, formerly a Dublin City Councillor, spent 10 years in prison from 1983 for the possession of explosives. After two failed attempts to win a seat in the Dáil, he was elected at the 2011 election. Ballymun representative Reilly has been a councillor for the party since 2014. Read: Poll: Would you vote for Irexit? Email “Ballymun Sinn Féin councillor resigns citing 'orchestrated bullying campaign' in area”. Feedback on “Ballymun Sinn Féin councillor resigns citing 'orchestrated bullying campaign' in area”.